Our 3rd and final piece on Baby Dominic Axel Jones’ cheerful nursery is a gallery of images. Enjoy! The post Parker Perfect! Baby Dominic Axel Jones’ Parker Nursery (Part 3 Of 3) appeared first on The DOM Family. As usual, part 2 of our coverage of Baby Dominic’s Parker Nursery features a mini-interview with the wonderfully talented mom, Tijana Jones. When we found out that we are expecting our first son, we had to switch from pink and girly mindset that we are accustomed to due to our two daughters and turn towards more manly looks. Our inspiration came from the Evolur crib and bedding we purchased. We perceive white color as clean and gentle, navy as masculine and powerful, grey as calming and orange as playful and adventurous. What drew us to Evolur brand are looks and functionality. We shopped at many different price points, anything from inexpensive to very expensive nursery furniture, and no furniture compared to Evolur furniture’s looks. We love the purity and clean feeling of white cribs, yet we had trouble finding white boy cribs that weren’t plain and that had a statement. Evolur Parker crib and line is bold, stylish, modern yet classic and so much more!! !The crib is very well made, and seems like it will last many years as it is convertible, and the attention to details is outstanding. The same with the Evolur Parker dresser. A lot of nursery dressers have shallow drawers, making them not so convenient after the baby is a bit older. Evolur Parker dresser has plenty of drawer space, and the drawers are also deep, making them very versatile for larger clothing items. The biggest challenges in our son’s nursery were previous yellowish walls and cream carpet. They didn’t match any aspect of the new nursery color scheme, so we had to redo all of that first which was a lot of work. we both loved Evolur Parker furniture line. After we purchased the crib and the dresser, selecting accessories that would complement both was easy, and we agreed on mostly everything. This color scheme will hopefully represent our son well. White for purity and gentleness, navy for boldness, grey for being grounded and orange for playfulness and adventure. We chose custom made bedding by GiggleSixBaby from Etsy. The bedding encompasses all of our nursery colors and modern design, and compliments the crib’s luxurious feeling. The wall mural is made by Little Bird Wall Decals from Etsy. They customize the colors of their wall murals and will try to match the colors of any nursery if requested. The wall decals were easy to put up and added the whimsical feel. We also chose a big plush tiger sold on Amazon by Viahart, as a perfect bold addition. For book storage, we used Ikea spice storage racks that we repainted white. The plush rocker and reclining chair is made by Angel Line and purchased from Amazon, and last but not least, we chose a navy white rug that would tie the room together. The navy white plush rug is Little Love by Nojo, also purchased from Amazon. Our favorite element is Evolur Parker Crib. It is the center of the whole room. Our favorite design element is the striped accent wall that we painted, as it is a labor of love and patience, and is also fun. Yes, we selected Evolur nursery pieces not only because they are great looking, but because we plan to use them when our son is older too. 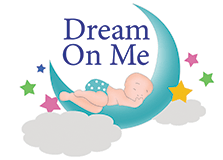 We will convert the crib to the full size bed when he is older, and since the dresser has large drawers, it will be able to accommodate bigger kids clothes as well. Our furniture is mostly white with blue accents, making almost any colors and themes complimentary. The very first word that comes to mind is “Wow”!! !We cannot believe that we created and decorated the nursery that feels so good to be in and we couldn’t have done it without Evolur and all the other makers of our nursery pieces and accessories. We hope our son will always know how very loved he is by his family and that he will feel great in his room!!! The post Parker Perfect! Baby Dominic Axel Jones’ Parker Nursery (Part 2 Of 3) appeared first on The DOM Family. The post Parker Perfect! Baby Dominic Axel Jones’ Parker Nursery (Part 1 of 3) appeared first on The DOM Family. The post Mompreneur Chrissie Wise takes us on a tour of her baby boy’s nursery appeared first on The DOM Family. The post Love on a spring breeze – Baby Lily Grace’s Julienne nursery (Part 3 of 3) appeared first on The DOM Family. “TA-DA!” again folks! As is custom, in our Part 2 of the 3-part nursery feature of Baby Lily Grace’s Julienne nursery, here is mom Stacey Cohen talking to us about the nursery and what inspired it and what she means to do with it in the future. Pink! Just kidding- well, not really. I wanted this to be a room fit for a little princess. I had gotten some inspiration off of Pinterest, like I’m sure we all have at some point but honestly it all just kind of came together for me. I would go to HomeGoods a lot and find pieces that worked together. From the beginning I knew I wanted to do a pink, white and gold theme and I just added on a little bit more from there- I found her flowers and decorations above her crib then everything else fell into place! I didn’t want a baby crib, I know that sounds so silly but I wanted her to have a little princess crib and a beautiful crib that she could grow into and évolur had that! The headboard is what sold me instantaneously! No, not at all- I love putting colors and designs together and I’m such a girly girl that I knew this would be no issue at all! we loved the gray crib, dresser, and accent pieces and everything else really made the room pop. I just thought that pink, white, and gold would be so cute together and it turned out better than I could have dreamed. Above her bed she has hand crafted paper flowers from Etsy which I LOVE and the flower letters are also from ETSY, the signs on the wall all are from Hobby Lobby and the 3 bookshelves are from Amazon. It was really important to make sure she had a library (there are at least 30 more books in her closet that don’t fit on the shelves). Every sign in her room has some sort of meaning about being special, being loved, and just being our everything! My favorite piece in the entire nursery is her elephant balloon tree which is above the changing table. We had a wedding tree (guestbook signature) for our wedding so it was important that our daughter had one too. Yes, absolutely! I adore the headboard in her crib, I think that when it’s time to convert her crib it will make the most beautiful bed and yes I have already bought her bedding- I couldn’t resist I saw it and it was too cute! Right now her bedding is princess hippo’s from Pottery Barn Kids with a mobile of princess swans from Buy Buy Baby and I found princess swans at HomeGoods- too cute! All of the pieces in her room are not “baby” pieces and aren’t things that need to be removed, taken off the wall to make that transition to when she will continue to grow. Well, that’s ok by us Stacey! The post Love on a spring breeze – Baby Lily Grace’s Julienne nursery (Part 2 of 3) appeared first on The DOM Family. Think warm sunshine, the smell of freshly cut grass and colorful little flowers bobbing their bright heads in a gentle breeze. Well, hello springtime! And that pretty much sums up Baby Lily Grace’s pretty évolur Julienne nursery. 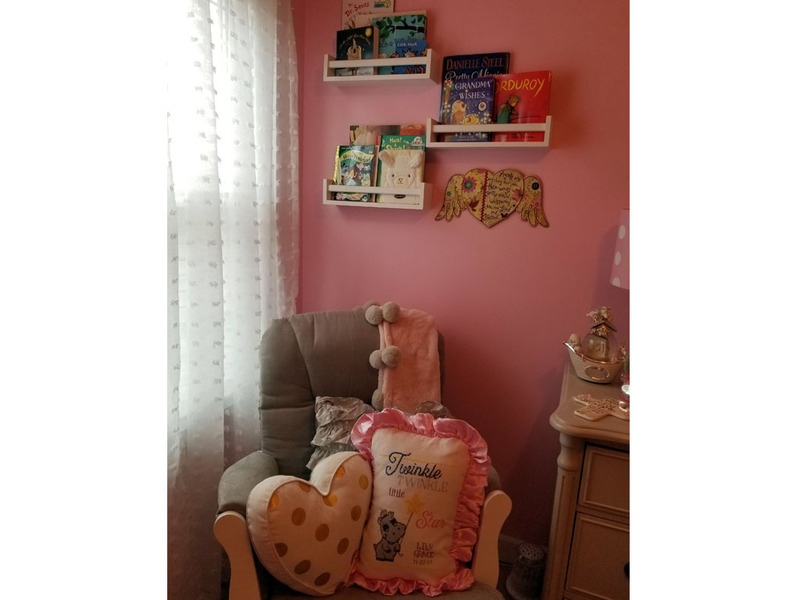 We can’t help thinking how fortuitous, how appropriate it is for us to be featuring this lovely nursery that is all pink, white and gold in springtime. Because, to our mind, it seems to embody the very essence of what spring is all about. The nursery is well-lit, thanks to a strategically placed window on the right corner of the wall opposite the entrance to the room. The fact that the room is not overly large coupled with the translucent chiffon drapes on the window, allows for a soft, filtered lighting that accentuates the warmth of the pink walls. The crib, an évolur Julienne in Antique Mist finish rests against the left-hand-side wall. The wall above the head-boards is festooned with, what has now become ubiquitous, paper flowers from Etsy with Lily’s name in florals. A pink baby mobile hangs over the crib’s animal-print mattress and hippo-appliquéd quilt based on ivory white. Next to the crib, in the corner, are printed baskets with a veritable zoo of super-cute, super-cuddly stuffed animals and a pink, white-polka-dotted baby sized couch. Now, what more could a teensy little baby girl want? Turns out, mom Stacey Cohen knows exactly what more she could want and makes sure it’s right there. In the corner, by the window and against the opposite wall is a comfortable-looking grey glider and ottoman. The glider is stuffed with… you guessed it – little pink-white themed cushions. Over this are bookshelves for Baby Lily’s reading. Next to this arrangement and directly opposite the crib is the double-dresser-changing station. The rest of the walls have a tastefully picked collection of wall-pieces. Of all the nurseries we have covered so far, this is one nursery where the crib does not take center-stage. Instead, it simply blends into the décor, serving, as it were, a functional need. The reason for this, it seems to us, is quite simple. Everything – every single piece of furniture and accessory – has been carefully selected with not the nursery in mind but Lily Grace in mind. It is beautiful, it is chic and it is deeply, deeply Lily Grace. And we just love it all. TA-DA! The post Love on a spring breeze – Baby Lily Grace’s Julienne nursery (Part 1 of 3) appeared first on The DOM Family.